Obituary – Hoplins, Gloria Belle (Kemnitz) « Perry High School Alumni Association, Inc.
Gloria Hopkins, 91, of Perry, OK, passed away Thursday, April 20, 2017 at her home in Perry surrounded by her family. Arrangements have been entrusted to Palmer Marler Funeral Home in Perry. A Celebration of Gloria’s life is scheduled for 2PM Tuesday, April 25, 2017 at First United Methodist Church in Perry with Pastor Adam Leathers officiating. Interment will follow at Grace Hill Cemetery in Perry. Visitation will be 10AM to 8PM Monday, April 24, 2017 at Palmer Marler Funeral Home. Gloria was born January 19, 1926 in Perry, OK to George E. and Bertha (Johnson) Kemnitz. She traveled around the country as a little girl with her parents, but returned to Perry her junior year of high school. She graduated from Perry High School in 1944. (Note: After she was crowned queen at PHS, a new rule went into effect that female students could only be named queen for one sport or event during the year). Soon after attending Tulsa University for a year, she and Harold M. Hopkins were married on November 18, 1945 in Tulsa. Gloria was a Master Gardener. She loved gardening and working in her flower beds. She was a member of the Petunia Garden Club, and the Noble County Republican Women. She was also an avid Bridge player and an excellent cook. She could make one of the best Sour Cream Raisin pies you ever tasted. She was of the Methodist faith and attended Perry First United Methodist Church. To her family she held the titles of mother, grandmother, great-grandmother, and friend. She will be greatly missed. Survivors include one daughter, Debby Brown and husband Mickey of Perry, OK; three grandchildren, John Brown, Jeffrey Brown, and Nicole Kleinsasser; four great-grandchildren, Hanl Brown, Hailey Brown, Sidney Kleinsasser, and Derek Kleinsasser; one sister, Patricia Laudon of Casper, WY. 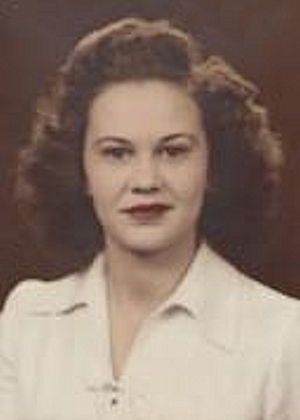 She was preceded in death by her parents, George and Bertha; husband, Harold M. Hopkins in 2015; one son, Rodney Hopkins in 2010; and one brother, George Kemnitz, Jr.
Family requests memorial donations to the Shriners Children Hospital, or First United Methodist Church in c/o Palmer Marler Funeral Home, 203 Fir, Perry, OK, 73077.